HURT_ART is a installation project: and as a concept it homed in on the hollow gratification of consumerism like a heat-seeking missile. The project came to life as a response to selling imported clothes in a local art gallery, while organising little or no cultural events. Posters around the city advertised a huge sale, inviting the locals to participate in the event. 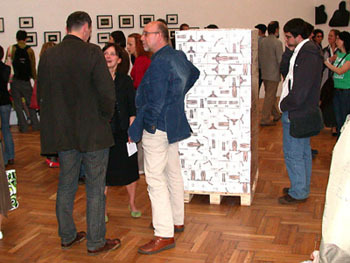 Many people came to the gallery expecting to stock up on cheap t-shirts or underwear, only to face tables covered with black cloth, with panels reading “We are sorry, the merchandise has been buried”. Every day is dominated by consumption. Families consume their time in supermarkets chasing promotions and sales wondering where the time has gone. The chance to purchase something at a bargain price becomes their life bargain. 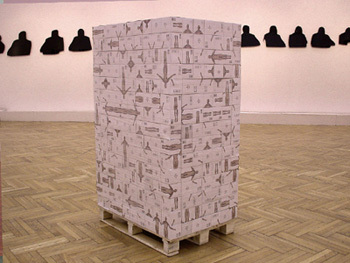 To create the installation “HexaMan” I used a direct scanning technique. It’s a modern photogram. A “contact sheet” from the surrounding space, which uses digital technology without using a lens. The only source of light was the scanner lamp. The images were created using digital technology in a severely limited way. High tech gear had to be combined with restrictions regarding the amount of light, image size and resolution, time of capturing the image. Another difficulty was that in order to complete the scans I had to struggle with my own body, as well as the space and objects around me, which is not the case when using a simple camera. 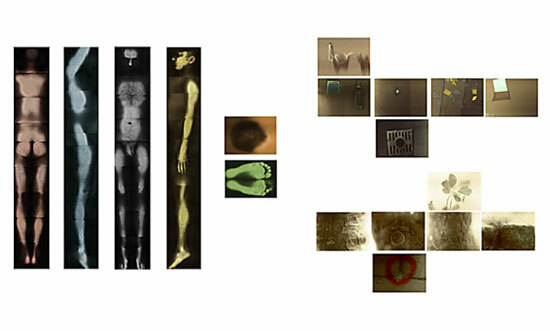 To create these images I had to go outside with the scanner and hold it close to or even touching the chosen objects. All these limitations do not fit the usual perception of digitally created pictures. 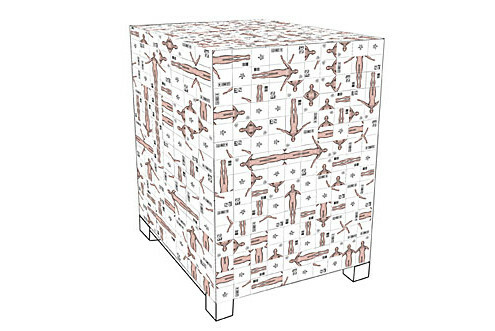 The space around us, represented in “HexaMan”, in fact resembles an arrangement of two open cubes. These are the only two states of human existence – “in” and “out”. The images are arranged in more or less geometrical grids, which makes the space viable for pricing, packaging and systematizing. The space in which we live and work becomes a product, ready to be put up on sale. 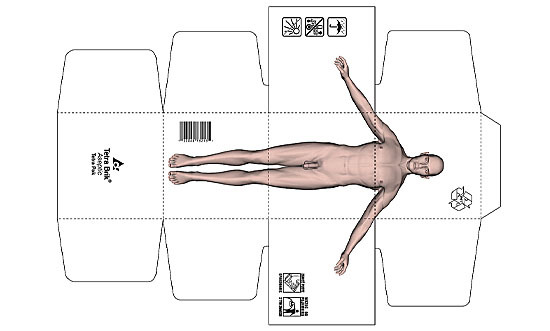 The six pieces of human body shown above emulate the six-colour hexachrome®CMYKOG printing system. High quality reproductions, virtual reality, marketing, barcodes, price tags – these are the attributes of the world we live in. In the 21st century, the body is no longer what it used to be. 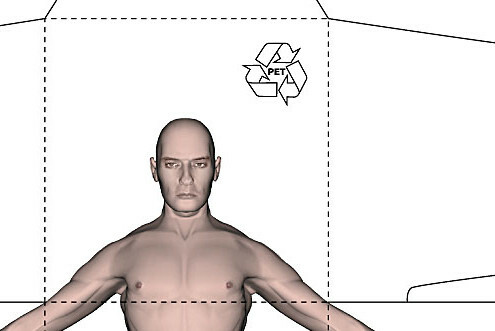 In the cyberspace, the human body doesn’t have a strictly defined anatomical structure anymore. The line between the natural and the artificial becomes blurred and we are not reluctant to this process. The body is not perceived as an organic whole anymore, since it is subject to the influence of technology. 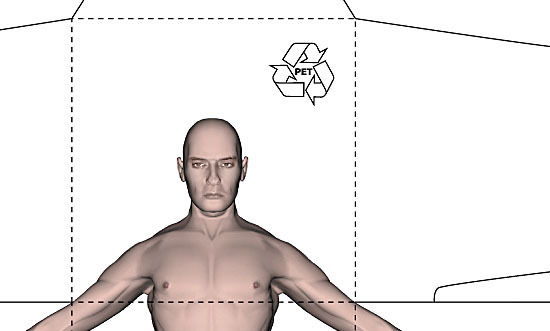 The body which I generated using 3D modeling software for “PET” has been once more projected onto a basic solid figure (a quadratic prism) in the same way as it was done in “HexaMan”. The title of the work has been taken from a typical labeling which can be found on plastic bottles, meaning polyethylene terephthalate. The digitally created picture was transferred to the sides of a cardboard cube, which was then printed in a run of 1440 pieces. Then, the cubes were stacked on an Euro-pallet, ready for shipping. 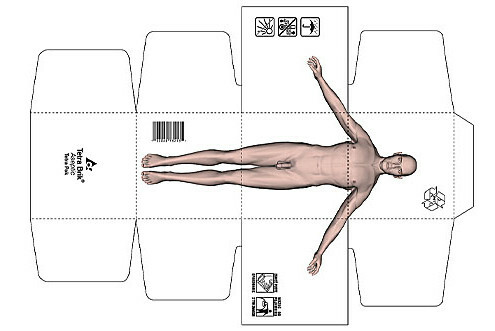 Arranged bodies are ready to change their location to more or less known regions. The bar code, when scanned, allows us view the item’s parameters: age, weight, height, place of origin. 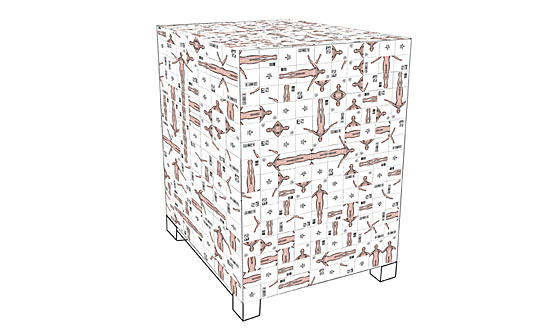 The resistant glued cubes cannot be opened and later put together again. They can only be deconstructed and destroyed at the same time. Then, they can be disposed of in a suitable trash bin, according to the instruction. Nowadays, we are often dealing with improving the body through the use of computer software. We more and more frequently want to intentionally forget about the natural and outdated. We don’t accept our looks. Our bodies must be perfect and the need for perfection has found an answer in the cyberspace. 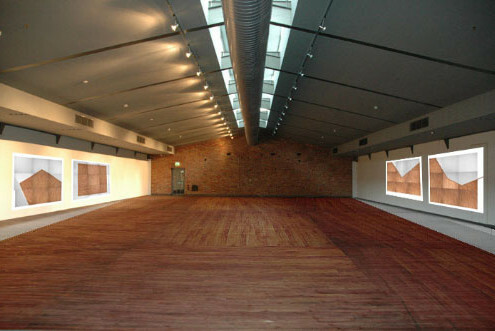 It is an additional space for the body – an extra fourth dimension. In this new ideal space our previous bodies seem to be tired and worn out. It doesn’t mean, however, that we have to discard them. The natural can co-exist with the artificial, creating new common grounds. “Woodstock” is a set of four digital photographs. 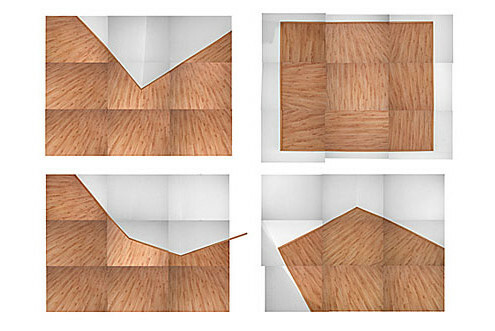 Each of them consists of 9 individual images of real floors. Put together in the right order, they create new, seemingly real spaces. The only kind of manipulation used in the process was combining the parts. At first glance the floors seem perfectly normal, possible to observe in our usual surroundings. After closer examination, however, we realize that there is something “off” about the lighting and perspective, and that such spaces do not exist in real life. Tomasz Cichowski sees a metaphor of human nature in the ambiguity of geometric shapes. Flat and definite, yet also abstract and unreal due to their spatiality, they tell us of humans limited in their physicality yet spiritual, undefined and unable to be described. Geometric shapes of daily space — the walls, the floor, the ceiling – suitably and precisely stand for the vague human anxiety.